YouTube musician CelloBassett uploaded an incredible cover of the famous “Lost Ancient Ruins” from A Link to the Past. 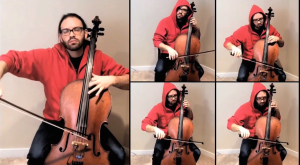 All melodies are arranged using cello, and all performances are synced to make an amazing cover of a great Zelda tune. Be sure to hit the jump to check out this video! “Lost Ancient Ruins” is a great song from A Link to the Past and is one of the most haunting songs of the series. CelloBassett does a fantastic job in doing this song justice! Be sure to subscribe for more of his covers, as he uploads other great Zelda arrangements as well. What do you think? What other songs from A Link to the Past do you like? Share your thoughts in the comments below!